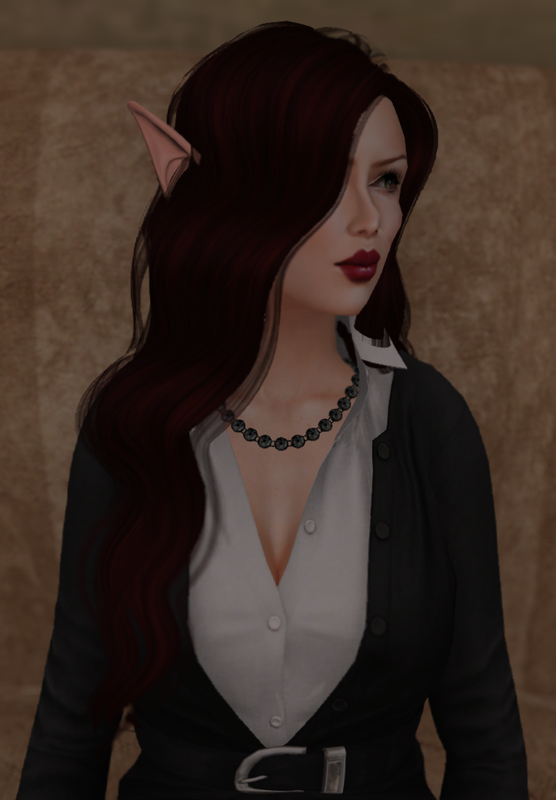 The Dateless Elf, with a curtsey to The Blogging Elf. "What if the pretty redhead in the office next door was an elf?" "There's this redheaded Elf woman, at work, she's very pretty, and she's Sapphic. You'd like her." "Oh? What does she do?" "She's the eye-candy receptionist, but Elves don't really have to work, they're all rich due to their long-term investments. They're the epitome of The Beautiful Elite. She works for fun." "She's probably stuck up and snooty and is probably already partnered with some unearthly beautiful glowy Elf supermodel, or something." "Naah, she's sweet and non-snooty. She complains about not having had a date since the McKinley administration back in 1898." "What? She's over a century old? Why hasn't she had a date?" "She says other elves think she's too obsessed with human fashion and likes shoes way too much. She says she's much too quirky and not 'ethereal' enough. Also she's not Elven aristocracy, most of those flit around in diaphanous gowns in their Treehouse Eld-mansions in gated communities." "She sounds like she's out of my league." "You should give her a call, I have her number." "How did you get her number?" "She gave it to me when she helped me with a move." She'd just got home from work, when she got the call. Her date had got her number from that nice fellow from work she'd helped with a move to a new apartment. A Date... after 100 years. And the call was from one of those interesting human women, who were quite unlike those prissy jerks back home in the Eldemar Gardens Community. Huzzah, as those lovable steampunkers would say. Now...what was she going to wear. Her date had mentioned wanting to see her wings. She didn't have the heart to tell her that elves didn't actually have wings, that some elves magicked them up and wore them as a fashion accessory. It's not that she blamed her date, most humans didn't actually know that much about the differences between Elves and Fae. She decided on a simple black cocktail dress...and went ahead and magicked up some wings. After some thought, she put on a pair of sandals with wings. If some butterfly-winged Fae flitting about, thought she was appropriating their fluttery adorableness, fie on them. She'd wear what she wanted... after centuries of conservative hoity-toity Elven aristocracy saying that elven women needed to be all glowy, medieval-y and diadem-y....she'd had enough. Glowy sparkly magickalness was all well and good, but everything in moderation. Besides, human fashion was fun because it changed. She decided to meet her date at one of her favorite women-centric social venues, called the [e bar]. She sat at the bar, nervously wringing her fingers. It had been a long time since she'd done anything in the romantic vein. 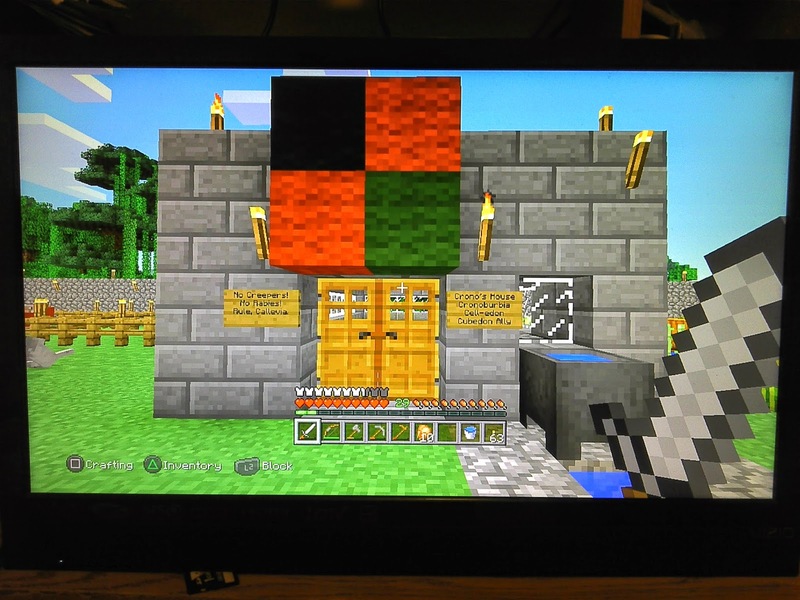 I play Minecraft more on the PS3 these days, the analog movement and crafting interface makes it a quicker to play. You're probably thinking: "Hey that looks like a Caledon Flag!" Yes, yes it does. I put up the 4 block Caledon Flag in all my single player worlds. And I, of course, Surrender to Callevia. 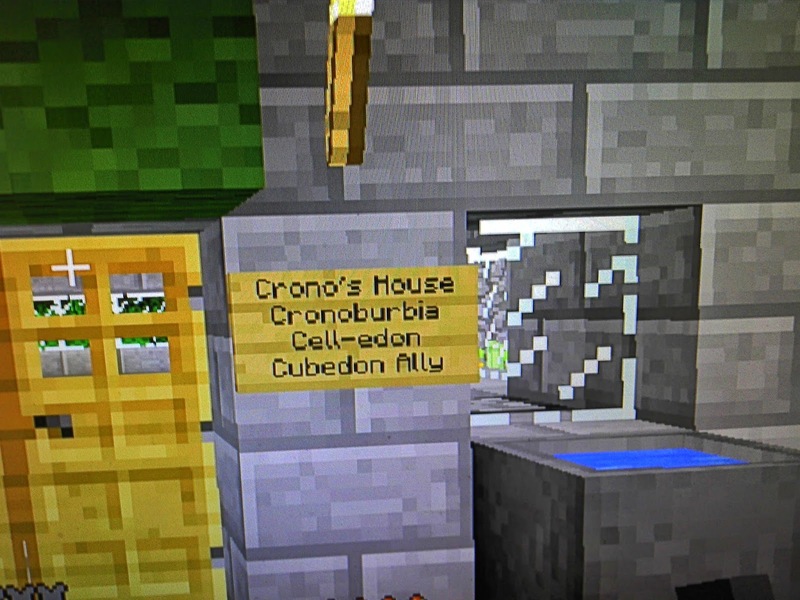 It's an in joke to some of use Caledon Minecrafters. Since the PS3 uses the Cell processor, I call it "Cell-edon". More after the break, because there are a LOT of pictures. No Demo, No Purchase. More CC McCrankypants. 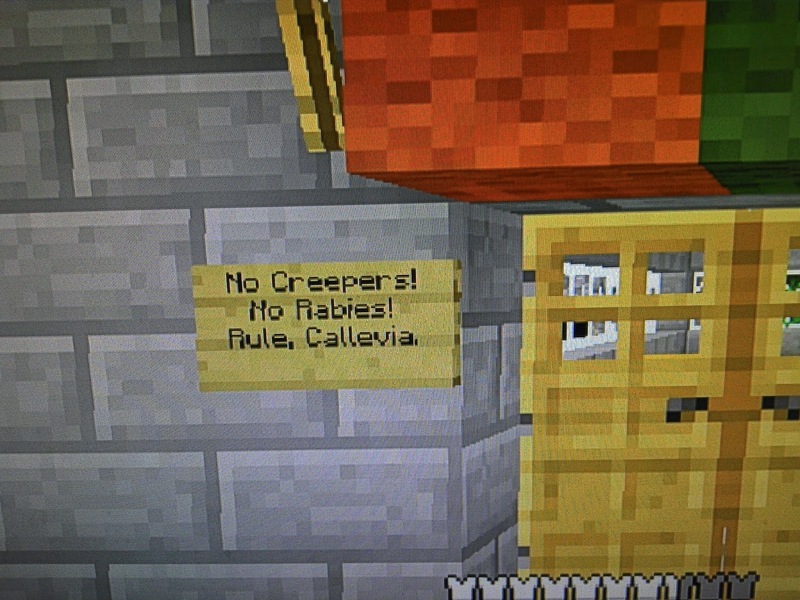 I have a rule. If there's no demo for a wearable mesh item, I won't purchase. It's that simple. I consider demos an absolute requirement for any wearable mesh. Today, a friend of mine visited a store called ArisAris and didn't see any demos. I popped over thinking it was maybe a rez issue, or they were hidden in tiny prims on the vendors, but no. There were NO Demos, NONE, Zero, Bupkis. And before anyone asks, there aren't any demos on the ArisAris marketplace either. This isn't some new designer either, this is 7 year old Ariadna Garrigus. She should know better. See that white tunic up there? I kind of liked it and wanted to try it, but I'm not going to purchase it because Mesh is a crapshoot even within designers own lines....I need to know if it fits. So I need a demo. Heck, I don't even buy Truth Hair without demo-ing it first. I was going to do this for April Fools: Teefy Marlene/Marley. Ha ha ha ha. For those who haven't figured it out, I'm "doing an impression" of famous fashion blogger "Gogo" of Juicybomb. In fact, that Truth Althea hair is the one she's wearing in her blog header, and she wore this Tee*fy outfit a few weeks ago...except she did the blue and I was surprised she didn't do pink. She wears a lot of pinks (and creams and whites and pastels in general). If Gogo was a cupcake she'd be a pink cake with pink frosting...and pink candy sprinkles. So when I picked it up, for this shoot, I got the Pink. That's Pink Fuel Harley skin of course. And yes, I have the hair in my proper red too, it's a piggie bun, I had to have it even though you cannot remove or turn off the headband. Truth we need a headbandless option too! Tee*fy Marlene is the Blouse, the skirt is called Marley. It's very girly cutesy sweet, especially with the schoolgirl collar option. And yes, the reason I'm using the Ohmai! 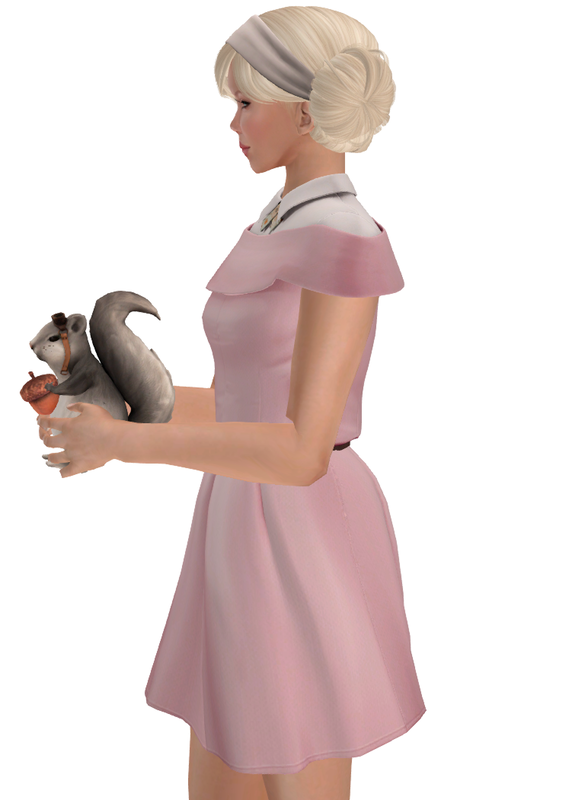 Steampunk Albino Squirrel is because I can't get the Ohmai! Mochi Bunny that Gogo has sometimes posed with. 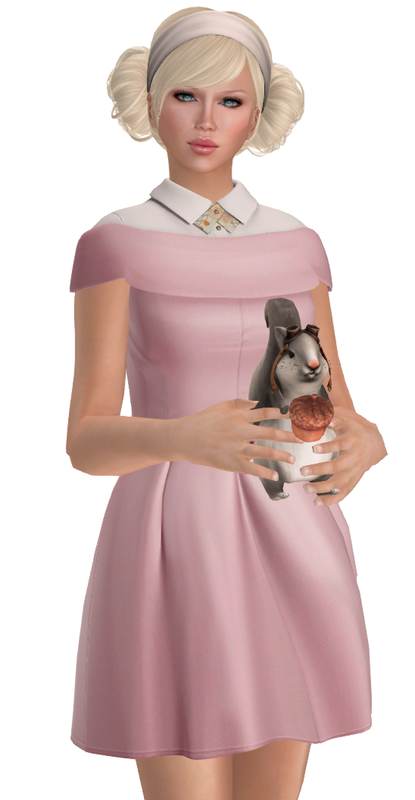 It's not like I don't like the squirrel, it's very cute (Look at it's little steampunk goggles! ), but it's not quite as cute as the bunny. If you don't want the schoolgirl collar option you can wear an off the shoulder version of the top without the collar. Which makes it a cute little party ensemble if worn with non-cutesy non-piggie-bunned hair like this Truth Rowan and with shoes like the Hucci Glynco stilettos And yes it comes in not-pastel colors. The rigging is fine too, this is reasonably well done mesh.